Codex Gigas: Devil's Bible or Just an Old Book? Scholars find a demonic drawing within a mysterious religious artifact taken as a spoil of war over five hundred years ago. At face value, the story of the Codex Gigas sounds like the script for Indiana Jones 5, but behind the gloss lie genuine questions. What exactly is this artifact? Did an evil monk create it in a deal with the devil, as some say? Or was it the work of somebody who just wanted to play mind games with readers? Let's find out what made the Codex Gigas such an enduring mystery - and what's the likely truth of its provenance. 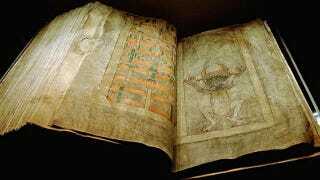 The top image is of the Codex Gigas, opened to the leaf of most interest, and from the National Library of Sweden. A codex is bleeding edge 2nd Century CE technology - a collection of bound pages that replaced a scroll. If you wanted to, you could walk around carrying A Dance with Dragons, announcing you'd bought the new GRRM codex. Codex is often translated into English using the word "code," which might be part of the reason a little more mysterious meaning is lent to codices in general. In an academic sense, a codex simply refers to a hand-written book, often containing hand drawn illustrations in the margins of the text or on separate pages. Within the codex is the sum of the Latin Vulgate Bible at the time, along with several contemporary histories, a comparative alphabet, medical texts, a calendar, and a few spells. The Old Testament and New Testament are separated and in an unusual order, with a number of works placed in between and after the religious texts, including Flavius Josephus' 1st century history of the Jewish people and a history of the area of Bohemia. Gigas is Latin for giant, so the translation of the Codex Gigas is "giant book." An apt name, as this codex is the largest single volume religious text surviving from 13th Century monks. The codex is thought to be from a Benedictine monastery of Podlažice in the modern Czech Republic (then called Bohemia), but the codex became a spoil of Swedish Army after the Thirty Year's War. Each one of its pages is handwritten, likely by a single scribe over his lifetime, with the codex three feet tall by a little over three feet wide when opened. Only 10 pages are missing from the codex - none of the texts are affected. Scholars believe the missing pages likely detailed a series of rules for the monastery. A book penned by Satan? Lore behind the codex suggests the book was the effort of one monk's labor in a single night. After breaking the rules of the monastery, he'd been sentenced to a slow death - he'd be walled up in a room of bricks. The night before his sentence would be executed, the monk decided to write his last work, an evil book written on animal skins. He realized that finishing the book before imprisonment would be impossible, so he made a Faustian deal at midnight with Lucifer to finish the book, with the devil signing the document by painting a portrait of himself on the 290th leaf. National Geographic recently calculated that it would take one person working five years straight to re-create the contents of Codex Gigas by hand, omitting the ornate illustrations. A work of this calibre would likely take thirty years of steady labor to organize and achieve. So the reality contradicts the lore, to say the least. After the image of the devil is a page devoted to warding off evil spirits and sickness. On this page are three conjurations and two spells, likely intended as protection from the devil and not an invocation, due to their juxtaposition with the previous page. Further removing an intentional demonic connection is an image of the Heavenly City placed before the demon and the spells. The lack of additional demonic content makes it seem that the image of the devil is present only as a symbol, not as an object of worship. The codex contains nothing else out of the ordinary for the time period. It is the last of a dying breed - one of the final single volume handwritten copies of the Old and New Testament created before moving to an easier to replicate (and carry) multi-volume format. Where is the Codex Gigas held today? Every page from the Codex Gigas is available as high-res scans online, and the codex itself is housed at the National Library of Sweden. The codex is not exhibited, likely due to sheer size and out of a desire to preserve the text. Sadly for the Satan lovers among you, the codex is clearly not the work of the devil - nor a devil-worshiper. The book appears to be a legitimate representation of the Latin Vulgate, with a few useful additional texts. If anything, the codex is a swiss army knife of texts for monks living within the monastery at Podlažice . The Codex Gigas lends a fascinating insight into a world where one person sat at a desk for a lifetime of penance and thought, copying centuries of combined texts, delicately placing each letter, line, and drawing to create a massive tome. Images from the National Library of Sweden. Sources linked within the article.